PORTLAND, ME – A radically new knife design, the RNGR ST-2 is a hyper thin folding knife constructed without screws or pins. Targeted at ultra-light adventurers and, at only 3mm thin, every pants pocket in America (regardless of how tight). Building on the success of its super lightweight credit-card-sized WildCard™ knife, Zootility’s RNGR ST-2 brings the convenience of WildCard out of the wallet and into the pocket. 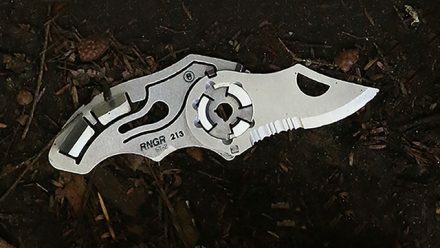 The most innovative EDC knife on the market, RNGR ST-2 is constructed of 440C stainless steel, a premium knife material, and is ultra-thin and light, allowing customers to store it conveniently, under the most extreme circumstances. Or under daily circumstances, in a pocket. The patented two-piece design, is not only unmatched on the market, but allows the product to be entirely manufactured in the US, where the cost of manual assembly is at a premium. This design also allows the carrier to remove the blade without any tools. This is convenient, for instance at airport security, if one forgets they are carrying it. An easy mistake to make, given the low profile and minimal in-pocket feel. This duo-lithic design allows for easy cleaning as well; simply pop the pieces apart and place in the dishwasher. “By utilizing stronger steel and increasing the thickness by a mere 1mm, we were able to make the blade and body more than three times as strong,” commented Zootility founder and CEO Nate Barr. “Our design and manufacturing teams have worked so hard on this project and we’ve made great product, RNGR ST-2 totally takes our EDC offerings to the next level,” added Barr. The RNGR ST-2 debuts today on Kickstarter with special introductory prices and offers. Barr hopes with the timing of this launch to attract last-minute Christmas shoppers who after backing ST-2 can print an IOU from the Kickstarter page.